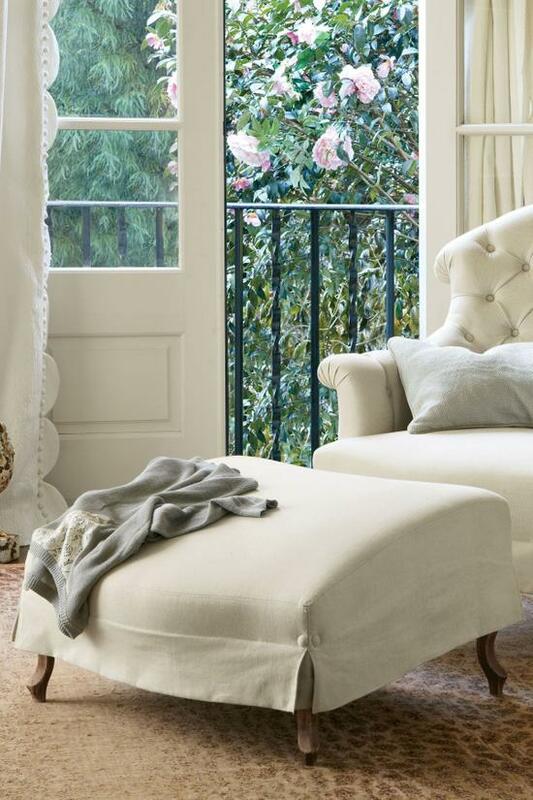 Upholstered in soft linen/cotton, Avignon's curved arms and perfectly pitched fan back invite hours of repose. Built to last from start to finish, the bench-made, solid oak frame and sinuous springs are topped by sink-deep, down-wrapped cushions. Hand-applied button tufting and button accents at the skirt add authentic detail. Versatile on its own, the matching ottoman has a shape that creates a decadently comfortable chaise lounge when accompanying the chair. This item has an additional delivery freight charge of $65.00. Bench made of solid oak. Soft 60% linen/40% cotton upholstery. Makes a decadent chaise longue with Avignon Chair (sold separately). 27"w x 25"d x 16"h.